Performing a political identity usually involves more than just casting a vote. For Left-wingers in Turkey, Greece and Cyprus – countries that emerged as the only non-socialist constituents of South-eastern Europe after WWII – political preference meant immersion to distinct ways of life, to ‘cultures’: in times of dictatorship or persecution, the desire to find alternative ways to express themselves gave content to these cultures. In times of political normality, it was the echoes of such memories of precarity and loss that took the lead. This book explores the intersection between the politics and cultures of the Left since the sixties in Turkey, Greece and Cyprus. With the use of 12 case studies, the contributors expose the moments in which the Left has been claimed and performed, not only through political manifestos and traditional political boundaries, but also through corporeal acts, discursive practices and affective encounters. These are all transformed into distinct modalities of everyday life and conduct, which are commemorated, narrated or sung, versed, painted, or captured in photographic images and on reels of tape. By focusing on culture and performance, this book highlights the complex link between nationalism and internationalism in left-wing cultures, and illuminates the entanglements between the ways in which left-wingers experienced transitions from dictatorship to democracy and vice versa. 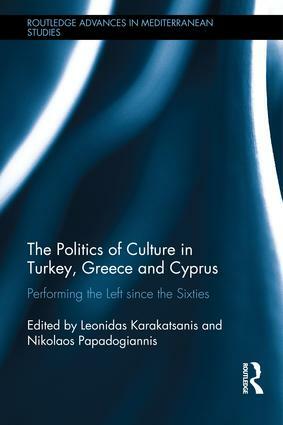 As the first book to analyse cultures and performances of the Left in the three countries, The Politics of Culture in Turkey, Greece and Cyprus causes a rethinking of the boundaries of political practice and fosters new understandings of the formation of diverse expressions of the Left. As such, it will be a valuable resource for students and scholars of cultural and social anthropology, modern European history and political science. In this edited volume, Leonidas Karakatsanis and Nikolaos Papadogiannis have brought together more than a dozen scholars who have been contributing immensely to different fields of social sciences for over a decade. This is not just another book on the emergence of nationalism in these countries or their similarities and differences. This book sheds light on understudied but extremely important issues such as the ‘intersection’ between the politics and cultures of the Left in Turkey, Greece and Cyprus…All in all, I would say this has been one of the most original books I have read on these three countries. Leonidas Karakatsanis is the Assistant Director at the British Institute at Ankara, and author of Turkish-Greek Relations. Rapprochement, Civil Society and the Politics of Friendship. His work focuses on peace and reconciliation, civil society, minorities, and the role of affects in contentious politics.